The Longo Review | Everything and anything related to books and ebooks. Barnes & Noble on the iPad: What else is new? Yesterday the news that Barnes & Noble would have an application for the iPad started passing around, making the usual jumps from site to site, from blog to blog and people seemed amazed by it. It struck me as downright weird that this should amaze anyone. Barnes & Noble has been on the iPhone forever, as has Amazon and other ebook readers, retailers, publishers, etc. I’m an avid reader of electronic books and have been since around 2001, when it became practical to be one. In that time, I’ve read a considerable number of titles, most of them purchased from FictionWise, which is “A Barnes & Noble” company. This entry was posted in eBooks on March 12, 2010 by admin. I strongly recommend this interview to everyone interested on ebooks. This entry was posted in eBooks on March 11, 2010 by admin. If you are a frequent or even infrequent reader of the Longo Review blog you may have noticed that it has gone through a general face lift. As of this month the tempo of new articles and comments on this website should increase considerably. I hope you like the new look and continue to come back for more comments on books and ebooks. This entry was posted in Future on March 11, 2010 by admin. Why would you want video and animation in a book? Ever since Apple’s iPad was introduced last month everyone has started writing about how magazines and books should now have embedded videos and animations. The more I’ve given thought to that I keep getting to the same question: Why? While I can understand the desire to have user controlled animation in the advertising of a car, so that the user can swivel it around and see what it looks like from all sides, I could not see why I would want anything of the sort in a book. In non-fiction titles you could add interactive charts, which could prove to be interesting and even animations for the explanations of something like physics. Now, with the concession that some books could benefit from having embedded animations, we can turn to the next question: How are these animations going to get done? I mean, I don’t really know any authors, even physicist authors are not high on my list of promising graphic artists. If these kinds of illustrations are to become mainstream authors are going to need specialized tools and then you have to consider if you really would like to live in a Harry Potter kind of world where all the illustrations in your book are animated. If while authors don’t have specialized tools for creation the animations they would like to have in their books, perhaps publishers could hire special graphic artists that are up to the challenge of handcrafting these books for new devices such as the iPad. While this cannot be considered a bad move it will increase the product cost of each title. Higher costs, generally translate into higher consumer prices which I’m pretty sure is the exact opposite that the consumers want and expect of ebooks. On the fiction side of things, the equation is a lot simpler. I buy a fiction book to read it. While I might find entertaining to browse a couple of illustrations, they certainly would not be determinant to my buying decision. I might skip reading altogether and go for an audiobook, but I certainly wouldn’t trade reading a book for watching a video. Oh, wait! Videos! What a great idea! Our reading devices now support video, why don’t we make a video of each book?! Wait! Someone already thought of that! They are called movies…. This entry was posted in Future on February 22, 2010 by admin. After eleven years I’ve finally completed the Gibraltar series by Michael McCollum. I enjoyed all three books and actually read them quickly. Eleven years was just the interval between the first and last book of the series were published. Now that you don’t have to wait as long to read the last book, I highly recommend this series. The first book, called Gibraltar Earth tells of humanity’s first encounter with an extraterrestrial intelligence and of the chilling revelation that one species dominates all others in hundreds of thousands of worlds. Those who won’t submit are summarily destroyed. In Gibraltar Earth the humanity takes its first steps in confirming the information that the have been given is in fact true. While in the following two books the story plays out in ways which are not totally unexpected and that can sometimes be quite predictable, the reading is light and generally entertaining. Gibraltar Earth was one of the very first ebooks I purchased, back in 1999. I read that first novel in paper form, after printing it out on an HP Laser printer. Gibraltar Sun, the second book in the series was read on my notebook’s screen while the last title, Gibraltar Stars, was read on my iPod. I guess this progression shows just how far ebooks have come in these eleven years. This entry was posted in Sci-Fi on February 22, 2010 by admin. I found an interesting article on how Magazines and Newspapers are responding to the iPad and Apple’s revenue sharing model on Ars Technica. Reading this article got me reconsider how I view what their position on the impact of the iPad should be. To me it always seemed obvious that publishers of magazines and newspapers should welcome and embrace a device which might help regain relevance to their properties, but it seems that they don’t agree. This entry was posted in eBooks, Features on February 17, 2010 by admin. In a live TV interview MCGRAW-HILL’s CEO confirmed that Apple will introduce an iPhoneOS based tablet device. He also mentioned that MCGRAW-HILL has been working with Apple for quite some time. UPDATE: I first saw this on Wired and noticed that it was also on MacRumors. In a couple of hours it was all over the net. I guess some people at Apple must be pretty upset by now. This entry was posted in Future, iPhone/iPad on January 26, 2010 by admin. Zinio for the iPhone or an Apple Tablet? Today I got an email notification of the release of a Zinio application for the iPhone. For those of you that haven’t run across Zinio, it is a visually oriented digital reader software. It was primarily focused on magazines but has been diversifying into books and textbooks. Zinio offers a very compelling reading experience with full colored digital magazines that look pretty much the same as they do on paper, including some nice age turning visual effects. While they do seem to offer more than one viewing mode, with a text only mode which seems designed to make it easy to read on a small screen, the whole thing begs for a larger screen. With the release of this application coming just one week before Apple’s media event it might just be that this application is an early release for the iPhone of an application that was already developed for Apple’s supposed new Tablet like device. It would make sense for Apple to seek out a content provider such as Zinio which can bring into the iPhone/iPod platform hundreds of highly regarded titles such as BusinessWeek, Newsweek, Popular Science, MacWorld, PCWorld, PC Magazine, etc. A quick look at Zinio’s website will get you a view of the new Zinio Library software which looks very much like iTunes, though it is probably just a convenient way of having millions of iPhone users familiar with how your software works. This entry was posted in Features, iPhone/iPad on January 19, 2010 by admin. Amazon took the Kindle to the world, with international shipping. Sony introduced new models of its Sony Reader with more size, feature and pricing options. The new Pocket and Touch editions are speacially interesting as they add both a lower price and touch-enabled options. This entry was posted in eBooks, Features on January 6, 2010 by admin. Barnes & Noble enters the eBook reader market with the "Nook"
Barnes & Noble has just made its move to enter the eBook reader market with the introduction of its own device. This device, called “Nook” is proof that there is plenty of chance for innovation in this field. The Nook adds a small, full color, screen underneath the eInk screen which is used for displaying the content for reading. By using this separate screen Barnes & Noble elegantly worked around the most inconvenient aspect of the currently available crop of eBook readers: navigating through your content. The eInk screen used in just about every eBook reader out there is great for displaying black on white content as it does not require energy to maintain the image being displayed. This allows for incredibly long lasting battery charges which is a great aspect for a device you would want to carry on a long trip. On the other hand eInk displays have notorious slow refresh times making them a pain for quickly displaying options and menus for navigating the devices actual content. 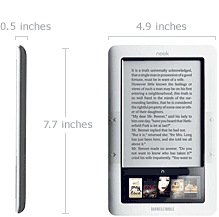 By using a separate, touch enabled, display for the navigation, the Nook allows for much simpler and faster navigation with a richer end-user experience as it can display book covers in full color. The Nook’s appearance is very similar to that of the Kindle 2, with the color screen taking the space used by a keyboard in Amazon’s product. In addition to the second screen, the Nook also goes beyond the Kindle in communication options as it allows the usage of WiFi for downloading content, allowing users to take advantage of any hotspot to get new books. With an introductory price of $259, the Nook could be an interesting alternative for those considering getting an eBook reader. This entry was posted in Kindle, Nook on October 22, 2009 by admin.